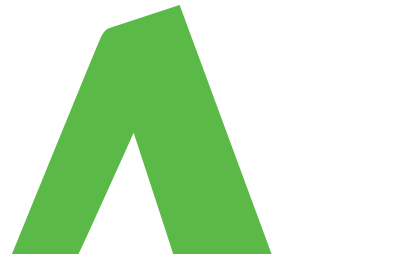 Below are some examples – please feel free to contact us if you would like more information on these products. Metrolock can organise for installation of this safe at your house. 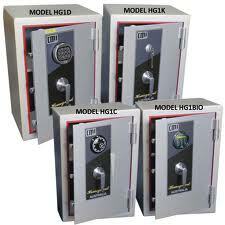 Metrolock can organise for installation of Homeguard Domestic Security Safe HG1 at your house or business premises. 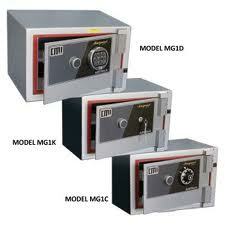 Metrolock can organise for installation of Miniguard Domestic Security Safe at your house or business premises. CMI SECURITY RANGE: Commercial grade safes in the CMI “Security” range, offer first class theft and fire protection in the one unit. Economically priced, the safes feature large internal space, with adjustable shelving and drawers and come in a range of 11 sizes – from 610mm to 1820mm high. The CMI Safe Co. has been designing, manufacturing and servicing safes throughout Australia for over 50 years. 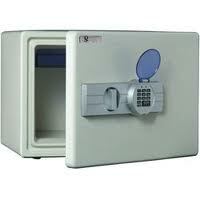 CMI Safes are used by all State and Federal Governments and many of Australia’s leading National Companies. BODY: Overall thickness of 80 mm. The barrier features a highly efficient material between inner and outer walls of specially reinforced steel. DOOR: Total thickness 85mm. The ‘Security” door provides a heavy steel front section supported by drill-resistant hardened plate over all vital lock areas. An inner panel of fire resistant compound also adds to the fire protection. INSURANCE COVER: A conservative suggested risk rating for Security Range safes overnight holding of cash and valuables would be $15,000 in an unsupported situation. ANCHORING: 2 x 20mm holes are provided in all models for anchor mounting to floor. 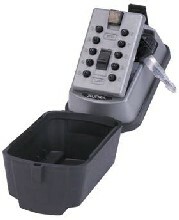 LOCKING: One La Gard 6 digit electronic combination lock model 3600, powered by 2 x 9v alkaline batteries, which secures the heavy 28mm front & rear locking bars, further supported by two automatic re lockers. 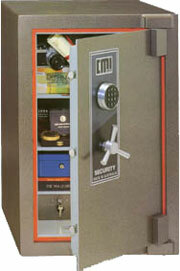 FINISH: CMI “Security” safes are available in attractive enamel durable finishes to suit office or home. Satin finish handles, locks and fascia panels complement the high quality appearance. INTERNAL FITTINGS: All models except SB have two lockable drawers and two adjustable shelves. SB has two adjustable shelves only. FIRE RESISTANCE: The Security Safe has been designed to give one hour fire protection. The SUPRA® Slimline KeySafe attaches securely to any wall or flat surface and holds 2-3 yale keys or 1 chubb key. The KeySafe is supplied with a black neoprene cover which simply slips around and over the KeySafe hiding it from view and protecting it from the elements. All KeySafes are made from Zinc Alloy and come with a 24 month guarantee. The Slimline KeySafe is supplied with a fitting kit which consists of 4 heavy duty expandable dyno bolts. These bolts have proven to be the most substantial way of fixing your KeySafe to brickwork. These bolts are STRONG, SECURE and very EASY TO USE. Call Metrolock on 1300 85 7771 today to work out which safe is right for you!